LEGGESY consisting of Neil “Gido-Blaster” Gido, Paul “Saw” La Pierre, and D.K. 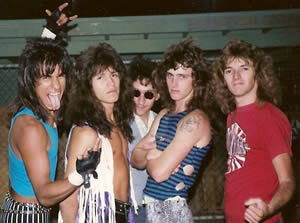 Warner formed musically in Albuquerque, New Mexico in 1986 and held intense vocal auditions for their 4th official member, Eddie Perea & finalized the original lineup in March of 1987. Gido & Warner had played together already for years since both were in 7th grade. 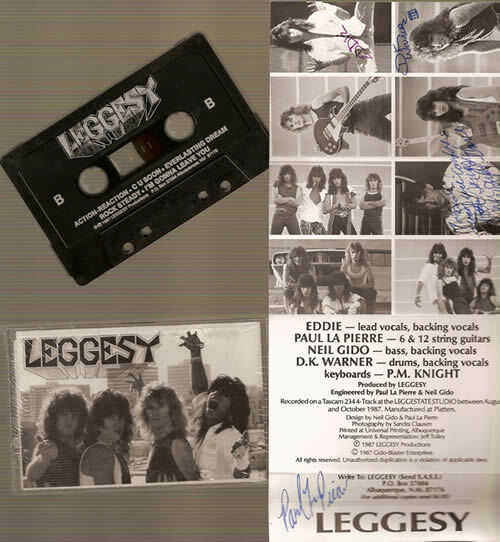 As young teenagers, the assembly independently recorded, produced, and marketed an all original 9-song debut released on Halloween entitled, “LEGGESY,” which instantly sold out its initial 1,000 copy pressing. A second much larger pressing was printed only a couple months later. Sadly deceased P.M. Knight a.k.a. Peter Martinez played keyboards on a few of the tracks and a string of the early live concerts. LEGGESY has made many various personal & musical appearances on radio including KZZR 94 Rock, Rock 108 KFMG, KUNM 89.9, as well as the nationally syndicated radio station, Z-Rock. LEGGESY has also appeared on various TV shows including Channel 27’s Teletrax, QFX, and Gido-Blaster & The Habitual Offenderz. They have been feature showcased and their videos were in heavy rotation on the music shows. The band’s photograph and quotes accompanied the front cover story of Albuquerque’s Sunday Journal. They have been featured in various publications including Connections and Mic-Line Magazine. The band also wrote and distributed it’s own bulk mailed monthly newsletter regionally. 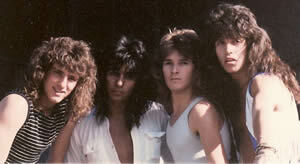 Drummer, Warner left the band and was replaced with 17-year old still in High School, Francis Ruiz in September of 1988. 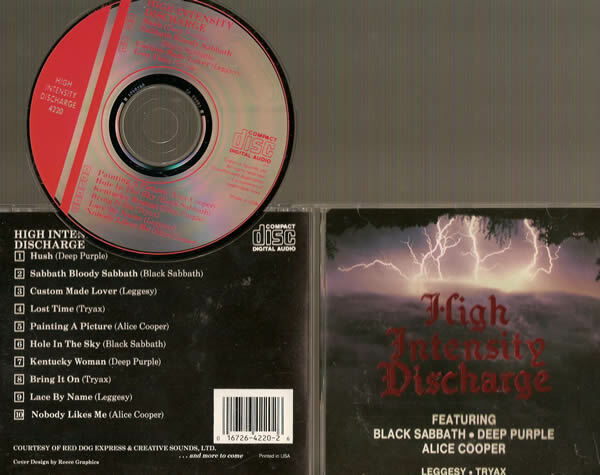 LEGGESY appears on an internationally released rock compilation available on CD and Cassette entitled, “High Intensity Discharge” released in November 1988. The release features two LEGGESY songs, and includes Black Sabbath, Deep Purple, Tryax and Alice Cooper. Incidentally, the Tryax song, “Lost Time” was co-written by LEGGESY’s Neil Gido. One of the LEGGESY songs, “Custom Made Lover” received a good amount of airplay on Z-Rock coast-to-coast radio broadcast out of Dallas. The song was played three times a day on Z-Rock’s “Too New” show. A video of the song was filmed & produced with footage shot using KGGM Channel 13’s (CBS) helicopter of the band performing on the roof of the then Holiday Inn Pyramid building. The video made its television debut along with four individual band member interviews captured at various locations around the city including up in the air in a hot air balloon. 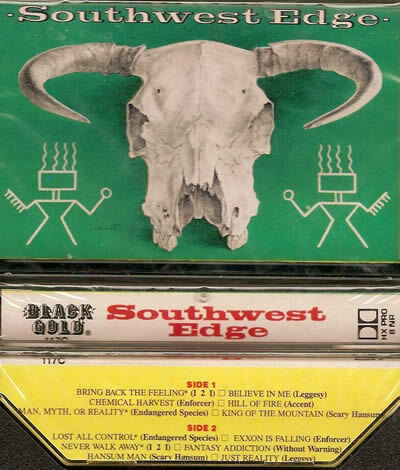 Two additional LEGGESY songs appear on the rock compilation, “Southwest Edge” released April 6, 1990. Throughout the band’s career, they performed live often and every location available from Roller rinks to the biggest night clubs to High School gymnasiums around the region. The band had opening slots for national acts including Vixen and Bad Company. 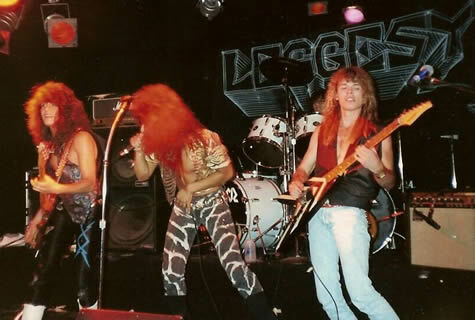 The band LEGGESY consisted of four strongly molded individual personalities whose musical chemistry and high-octane autonomy erupted in attitude drenched positive rock and roll experience which electrified audiences with it’s power rock original anathematic songs and visually stunning bombast of energy and sweat. The LEGGESY experience was an ultimate explosion of captivating & thorough entertainment, which received widespread recognition as one of New Mexico’s most powerful entities and voices in original music. In 1989 La Pierre was replaced with Craig “Razzmatazz” Rasband. 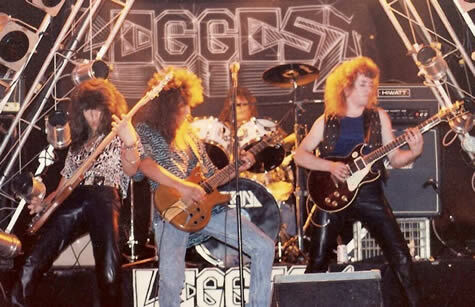 Craig had a 2-year heavy gigging stint with the band until 1991 when Sam Masters stepped in place of Rasband for a short stint before LEGGESY members went separate ways in August of 1991. Gido & later Ruiz went off to Hollywood and pursued music there. Rasband & Masters also went to Southern California to pursue their musical ambitions. 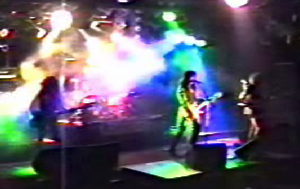 Rasband hit the LA club circuit hard in a band called, “I Hate Lucy.” Gido wrote and photographed for various rock music magazines and later produced, directed, edited, and hosted a weekly hour-long cable show for over 4 years (1996-2001.) The variety spectacle featured rare and live videos, adventures around the state, plus exclusive rock star interviews and spots which included the likes of Alice Cooper, Dio, Rob Zombie, KISS, Slaughter, Guns N Roses, Ice-T, LA Guns, among many others. Gido partnered with La Pierre again in a couple bands that bore some fruit with an independent CD released called, “Pressure” in 1999. 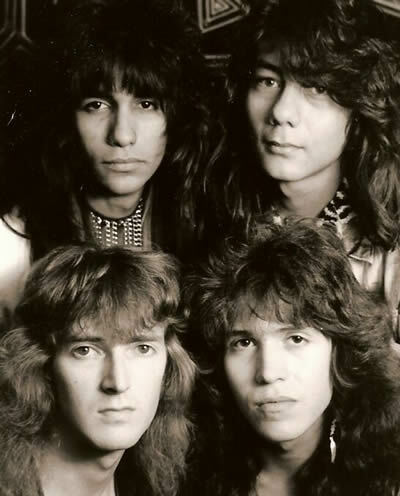 Gido also had his song and his 1990’s band, FutureX appear on the “New Mexico Rock Coalition” CD that was sold in the state and promoted at the music industry’s esteemed annual F Music Fest in LA, formerly known as the Foundation Forum. FutureX also won a Mic-Award for Best Music Video.